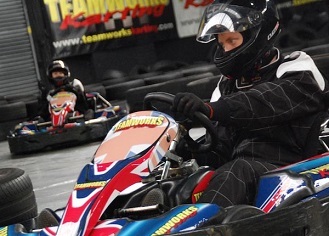 A very well run circuit, Teamworks is the only indoor karting track in Northampton and has been around for over 10 years. The circuit is a leader in corporate hospitality and are expert enough to allow customers to mix business and pleasure within their excellent facilities. Their central location provides easy access from the M1 motorway. Local towns – Buckingham, Buckinghamshire, Milton Keynes, Bucks, Rugby, Coventry, Warwickshire, Banbury, Bicester, Oxfordshire, Kettering, Corby, Wellingborough, Towcester and Daventry Northamptonshire are within easy travelling distance. From either Junction 15A or Junction 16 off the M1 proceed towards Northampton town centre. On approaching the town take the A4500 and follow the signs to St James. At the traffic lights (Thomas A Becket Pub) turn right into St James Mill Road and proceed roughly 500 yards into Harvey Reeves Road - GP Karting is at the end of the road. A great event for ten drivers; 5 laps qualifying to determine your grid position followed by a non-stop 60-lap race. An adult only sprint race - five laps qualifying to determine your grid position followed by a 120-lap race. There are conference facilities for 80.